This box comes standard with every option. Photos are examples only of custom commissioned projects we have completed. Upload your own military photos or custom artwork, and create a one of a kind, handcrafted in America Military Retirement Keepsake Shadowbox! The Custom US Military Keepsake Shadowbox. Includes – Inside lid cork covered felt shadowbox, 3 x 5 flag holder attached inside the bottom, and custom art on the lid top, inside tray, front, and inside bottom of the box, and nameplate. The included tray comes with a brass plaque and 2-row coin holder that is placed with your custom artwork. *Patches, medals, challenge coins, and flag are not included. Please upload artwork files or a placeholder file everywhere you want custom artwork. **If you have more than one piece of art, please upload ONE during check out and then the rest can be uploaded in the project manager after you place your order. Don’t worry 🙂 We have actual US-based HUMAN graphic designers on staff and your final artwork approval is required before we actually put your box into production. It is very important that you send us clear quality artwork for best results. We allow up to 5 different pieces of art in one location, there will be an additional charge of $19.95 per 5 items in one location. 1/4 Inch Natural Cork mounted on wood backing with felt color of your choice. Perfect for pinning medals, photos, patches, etc. Order Early! This custom box take 2-3 weeks from your approval of artwork proofs until it ships! Watch this video to see all the options included with this handcrafted military retirement gift. Surprise your Military Veteran at their retirement ceremony with this personalized custom “One of a kind US Military Shadow Box keepsake that is handmade in America. 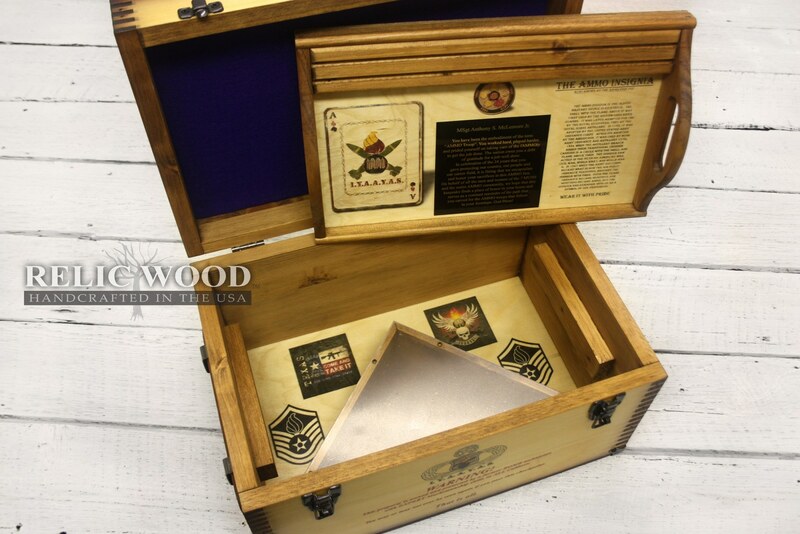 The Custom Military Keepsake Shadow box comes with Felt on cork board on the inside lid, flag holder with glass top under the tray, and a brass plaque on the tray. A great idea is to put custom rank artwork on the top, photos on inside tray with large engraved brass plaque, and an engraved brass nameplate up to 75 characters. 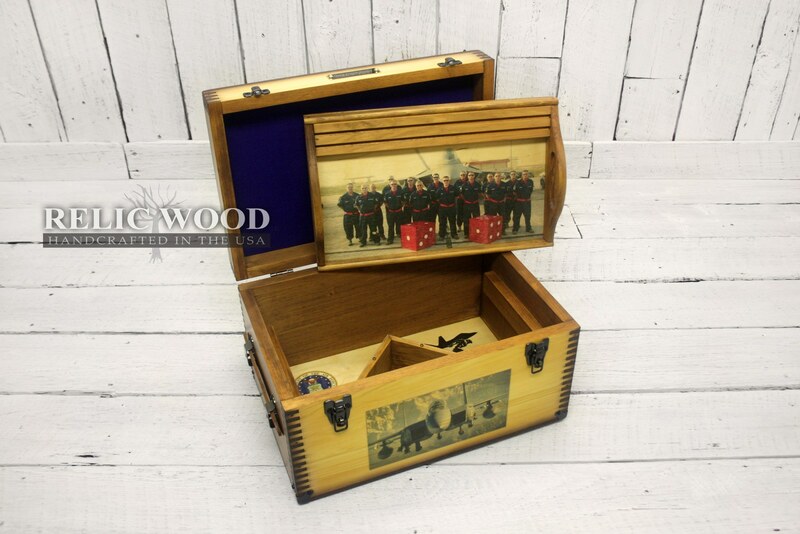 Check out our Custom US Military Keepsake Box then order yours and make it your own. Celebrate upcoming retirements with this personalized Military Retirement Shadow Box Keepsake Gift. The perfect alternative to a boring plain shadow box that is also portable and comes with a Military Challenge Coin Holder with two rows to store their coins. Below the tray, the custom fit US Flag holder is mounted to the bottom and has plexiglass to protect your flag. You can also remove and fly it by removing the six screws that hold the plexiglass in place. It is the perfect coast guard gift to present on any occasion. Once you place your order, our custom box designers will use your artwork and send a rendering of what your box will look similar to, or they may email you requesting more info or additional / better quality artwork. We try to keep all artwork communication via email to document the creation process. Please be aware that this graphic rendering is only an approximation of what the final product will be and be should be used for reference only. Our custom sublimation process means that your artwork is embedded in the wood and full-color artwork will differ somewhat from the renderings. 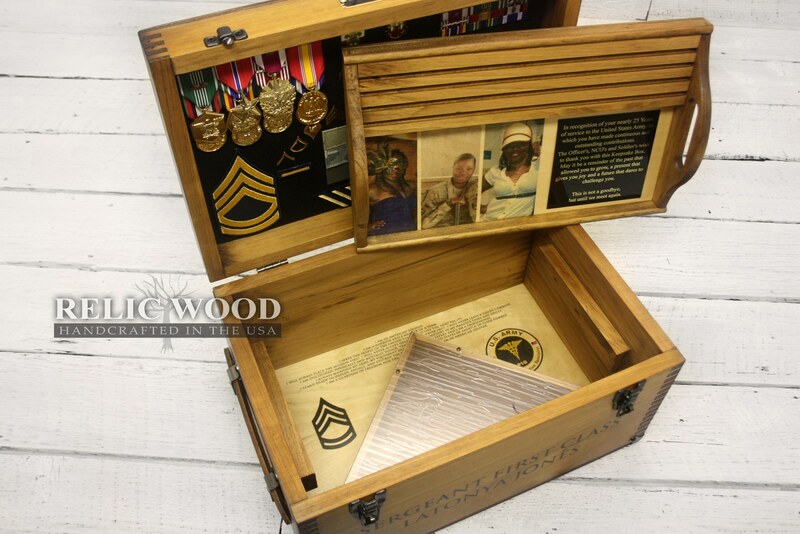 We look forward to making your personalized custom Military Retirement Keepsake Box soon!